The best thing about racing in cycling is there is something for everyone. Road racing (Tour de France style races, normally just one day though! 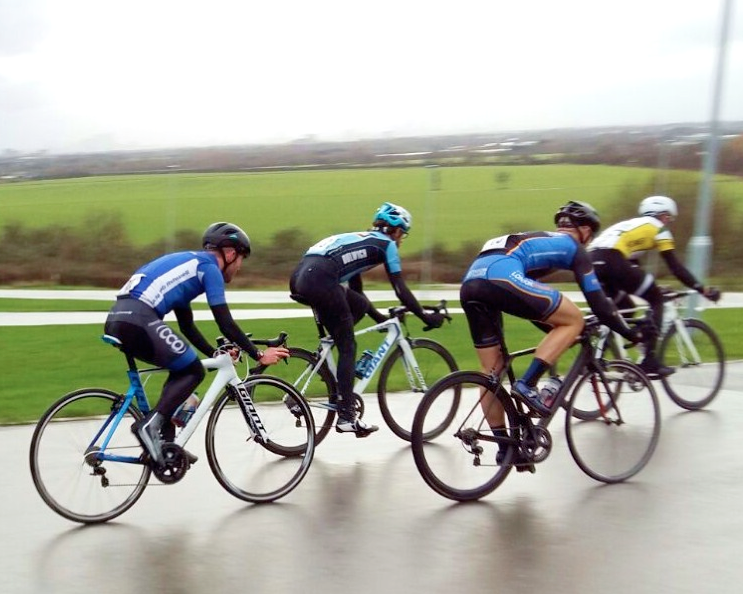 ), Criterium racing (road racing on a short loop – multiple laps), Cyclocross (racing a bike on a muddy field), Track racing (Velodrome), BMX, Mountain biking….the list goes on. The hard thing is deciding which events to do! 2015 was a year of concentrating on Road racing for me, a couple out on the open roads, approximately 60km in length, but mainly Criterium races, or Crits. The appeal of Crits to me has been that in the summer you can find a Crit on most nights of the week if you are prepared to travel. They vary in length, but are approximately an hour in duration. It was through Crits that I amassed enough points to progress from 3 CAT to 2 CAT, and I hope to use Crits in a similar fashion during 2016. I’ve been warned about WINTER Crits by several members of my club “DANGEROUS AND COLD” pretty much summed up the ‘advice’. However, with 200 points to collect in order to achieve my goal of gaining my first CAT in 2016 I decided to ignore the advice and use winter Crits, not only for gaining more race experience, but motivation to get out outside and ride in the winter months. 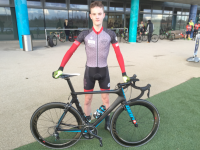 I did my first Winter Crit on 28 November, an E123 event at the London OLYMPIC park, and was really pleased to finish 4th. 6 POINTS towards the 200 I need – or so I thought! My inexperience had meant I didn’t realise the yearly points reset on December the 1st!! So, I went back the following three weeks, finishing 8th, 5th and 8th. All results I was pleased with, and as for COLD and DANGEROUS – not a crash in sight, a friendly bunch of racers and temperatures as high as 16 degrees!! Racing in shorts and Jersey on 19th DECEMBER! So I went into Christmas happy to have gained some good racing experience and 9 points from 200 needed. 9 January 2016 I experienced what everyone had warned me about – COLD and DANGEROUS – but they forgot to add in WET! Racing at the first of the Hog Hill series, I started the race with 63 other riders in the 2 and 3 CAT race. The competition was tough, but the elements were tougher, rain was washing gravel onto the circuit and as a result people were puncturing regularly. Luckily the event allows you a ‘lap out’ to change a wheel and rejoin the race in the position which you left it. I am sure however, that some people were secretly quite glad for a reason to pull to the side and call it a day, hitting the warm showers early. The race was eventful, a crash in an early break brought the field back together, and several other crashes whittled the field down. 40 minutes into the race, on a bend which had claimed several riders, someone literally T-boned my bike, breaking two of my spokes and buckling the wheel, somehow (couldn’t do it again if I tried) I stayed upright, watching the offending rider ride away, in his defence I heard him shout “SORRY”. I was able to limp my way to the pits and change a wheel in time to rejoin the bunch as the field came back around. The race really turned into a battle of survival. Two riders broke away in the last 20 minutes, and with 5 laps to go I felt done in, however I hung in with the group, and more a futile effort than anything I attacked into the last hill (the notorious HOG HILL), only to be swallowed by the group just before the crest of the hill. I rolled in to the finish in 14th place. Looking at the results afterwards 19 finished and 45 DNF’s!!! Now this must be what WINTER Crits are about. No points and a brutally hard race, but strangely it has only made me hungry for more. I’m also keen to finish my accreditation for track riding, giving myself the option at least of racing in the dry and warm over the winter months! Hope to be able to report my points tally has increased when I next blog, and that I’ve completed my track accreditation, and maybe even raced indoors!